By default this will go through all images contained within Photo Stream, that means every picture in the photos library of an iPhone and iPad, keep that in mind if you have pictures on any such device that you don’t necessarily want to share. Again you’ll want to remember that everything in the photo stream gets displayed, so you may want to create a specific folder or collection of images if you have some pictures you don’t want to share with everyone in your living room. If you do find yourself embarrassed by some of the pictures in your iCloud stream, do yourself a favor and transfer the photos from the iOS device and then delete them all from Photo Stream. I would LOVE to be able to do this on my Mac mini which is hooked up to my TV as a media centre. Shame it’s not built into the Mac OS screen saver yet… Would have thought that to be a no-brainer Apple. Photo Stream is a nice feature of Apple TV, but a shame you can’t reverse the order of the photo’s in the slideshow. Showing your holiday pictures the slideshow starts with the arrival back home. Also starting halfway somewhere, is not possible. In iPhoto 11 I published photo’s to a new photo stream, not the default photo stream and under the same Apple ID. 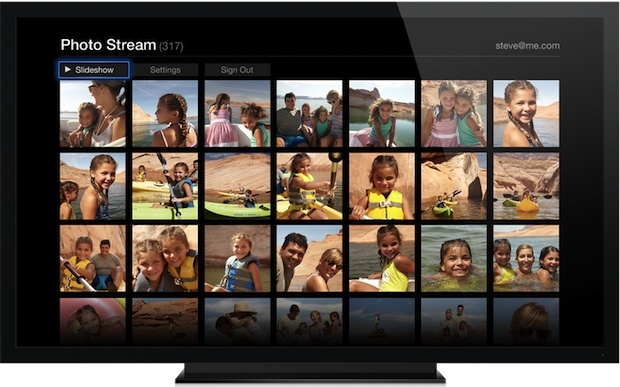 Does anybody know how to select that new photo stream in Apple TV (2G)? With AppleTV 7.0 software, there is no “internet” option. To turn on the photo stream you need to go to the ‘settings’ menu and turn on iCloud -AND- go to the ‘main menu’ under ‘settings’ and ensure that the ‘iCloud’ options do not say “hide”.